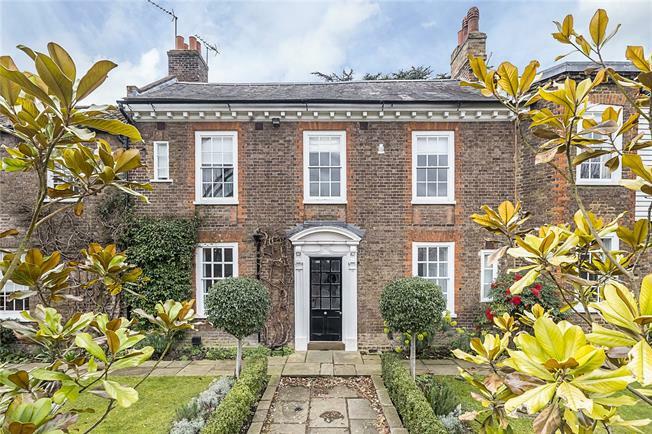 5 Bedroom Semi Detached House For Sale in Richmond for Guide Price £2,950,000. Dating from the early eighteenth century, Gort Lodge is a Grade II listed classic example of Queen Anne architecture, with its flat fronted facade and elegant, regimented fenestration. Later additions were made to both sides of the house and now create substantial and lateral accommodation that combines a harmonious mix of the original character and modern design elements, creating a wonderfully unique and architecturally interesting home. The house occupies a generous plot, providing lovely open aspects, an off road parking area and a garage. The delightful garden is walled and occupies the full width of the plot. It is mainly laid to lawn with a path connecting all areas and is extremely versatile due to its size and configuration. The 17th and 18th centuries were a golden age for Petersham, as it was elevated to the status of a fashionable rural retreat for the rich, aristocratic and influential. Ham House and estate had strongly influenced the historic development of both Petersham and Ham; this location and idyllic riverside setting resulted in the development of a remarkable number of urbane mansions within these once rural villages. what is a particularly scenic stretch of the River Thames. Richmond town centre is within a mile and a half and offers an excellent selection of mainstream and independent shops and boutiques plus a vast selection of eating, drinking and entertainment options. Transport facilities at Richmond are excellent; they include an express South Western Railways service to London Waterloo (18 minutes) together with District Line Underground and London Overground services. Local schools, both private and state, including the well-known German School of London, enjoy an excellent reputation.